Ok, remedy ok! I’ll concede that I might actually have a little, physician teensy tiny bit of a sweet tooth. There – I said it. Though it’s true that I often pass on the candy and cupcakes at work, I think I do actually crave sweet things. Sometimes. Especially if I make them myself, which means sweet, but not too sweet and most of the times means something Salted. What can I say? I’m a salt fiend. It just makes dessert more interesting – that pop of something salty – always surprising – makes sweet taste so much sweeter. This time of year, I love ginger snaps. They’re spicy and somehow warming. My favorite kind are the really gingery ones that have a good bite and nice chew to them. The Whole Foods brand gingersnaps are just perfect. I had a half a bag of those, some dark chocolate chips and hazelnuts. 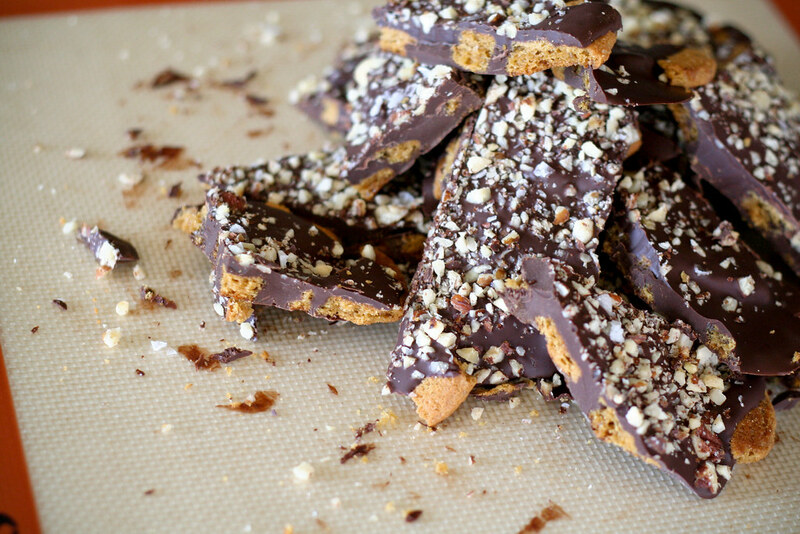 So, I made bark with them, which is basically a pretty way of saying chocolate with mix-ins. This recipe is actually really simple. 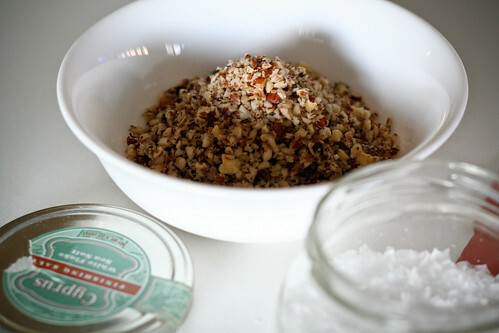 Crushed store-bought ginger snaps, melted chocolate, ground hazelnuts and a bit of flaky salt. That’s pretty much it. The hardest part is waiting for the stuff to cool. Next time, I might try graham crackers or even pretzels. The possibilities are endless, and that’s why I love recipes like this. Place the gingersnaps in a bag and beat them with a spoon or rolling pin until broken into rough pieces. You don’t want to crush them or they won’t stay crisp. 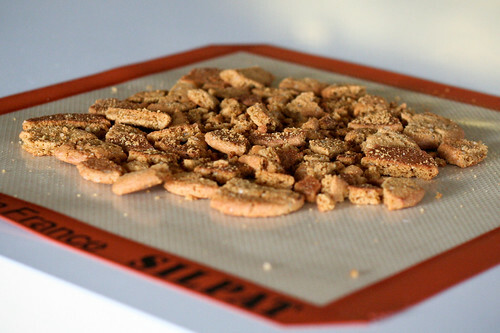 Place the broken cookies on a silpat (or silicone) mat or piece of parchment. Place a pot of water over medium heat. Put your chocolate chips in a metal bowl and place it over the pot of hot water, creating a double boiler. 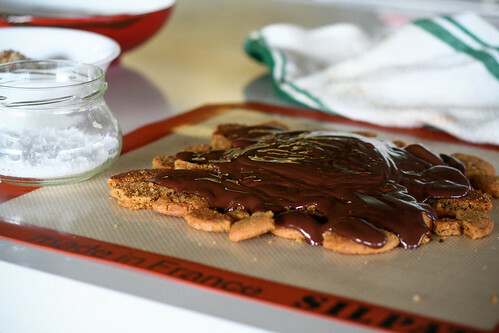 Stir your chocolate until it melts through, then carefully pour it over the gingersnaps until completely covered. Use a spatula to spread it evenly over the cookies. 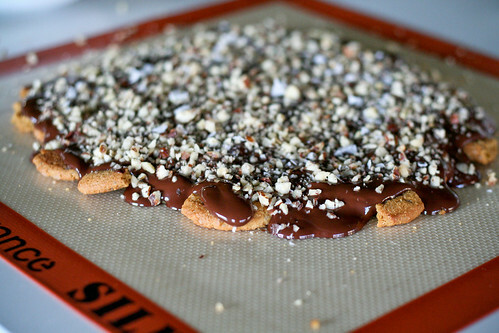 Quickly sprinkle the hazelnuts over the chocolate in an even layer. Then do the same with the salt. Let cool completely – until the chocolate has hardened through (you can refrigerate it on a flat surface to speed up the process. Peel the big piece from the silpat mat and transfer to a cookie sheet. Use a large knife to cut it into pieces. Yum! You have such a way for keeping things simple, but combining the perfect ingredients to make something amazing. This is almost as easy as making instant pudding! Gingersnaps make for a great snack in the fall and what isn’t better with chocolate? I like the salty/sweet combination also. Chocolate chip cookies w/ fleur de sel sprinkled on top? Yes please! I can’t believe I am going to try this, but I am! I love gingersnaps and love this idea! Salt and sweet is the best combo. I wil pass on the cupcakes and candy, but this is right up my alley! WOW – what a simple yet clever and lovely idea! LOVE chocolate and gingersnaps. I will have to try this! This looks great! I think the gingersnap ideal is priceless. Much more interesting than those barks that call for soda crackers. Pingback: birthday treats! or, how to not follow a recipe. « does that make sense? Now this is a sweet treat I can get on board with! I am not much of a sweets person, but this sounds delicious!